Part of making the holiday season merry and bright is making your home clean and bright. 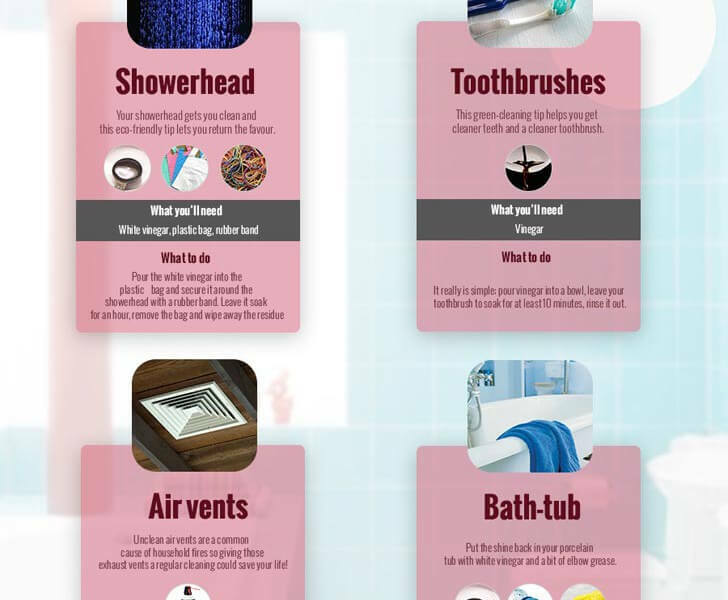 Now is the time to tackle those deep clean jobs you’ve been putting off in the bathroom and kitchen with these cleaning tips. Investing a bit of time now will result in you and your guests enjoying the time spent in your home more. Keep your Pivotech shower screen gleaming. Cleaning a shower isn’t the easiest household job, but it is important. It extends the life of your shower and reduces risks of moulds and mildews taking hold that activate allergies. Commit to regular cleaning beyond holiday guest season to remove and prevent a build-up of soap scum, mildew and hard water lime scale, and preserve the life of your shower screen, the anodized and powder coated aluminium sections. Fabric Softener – combine one cup of fabric softener and one litre of warm water to get rid of residue and soap scum on the glass. Wipe the mixture on the door and then rinse it off with warm water from your shower. Vinegar – vinegar is effective and safe for cleaning your glass shower screen. Put white vinegar into a spray bottle and spray onto the shower door. Scrub the mixture onto the screen with a nonscratch pad before rinsing off with warm water. Keep the spray bottle away from kids. Baking Soda – baking soda is magic. Spray the shower with warm water, then wipe baking soda on a cloth. A paste will form. Rinse off with warm water. Wipe the surfaces with a clean, nonabrasive damp cloth using warm water and nonabrasive, pH neutral detergent solution. Never use abrasive household cleaners, steel wool, hard brushes or excessive abrasive rubbing which will wear, damage and dull the finish. For more stubborn dirt, a mild detergent should be used with a soft brush or sponge. Maintaining a clean shower isn’t anyone’s favourite chore. That’s one of the reasons we’re so excited about the new Momentum semi-frameless sliding shower screen. 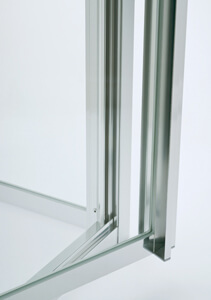 Our product development team engineered bottom guides can be disengaged to make for easier cleaning between the door and fixed elements. Very cool. No matter how beautiful the shower screen, how impeccable the installation, how durable the hardware, Pivotech products can’t continue to gleam if they aren’t maintained by the home owner. However, finding cleaning tools that don’t do more harm than good (ie harsh chemicals that damage the glass, metal finish and seals) can be a challenge. I love this infographic from the Cleaning Services Group. It complements Pivotech’s recommended cleaning and maintenance practices and I wanted to share it with you so you could share it with your customers.